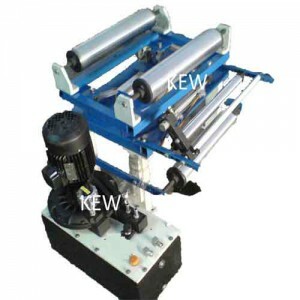 KEW is the most leading manufacturer for single Roller Assembly With Web Guiding System. It consists of two rectangular steel tubing frames. One is stationary, the other is movable. It is supported in a nyalguide sliding block and arcuate bar system and has ab idler roller at either end. It is insensitive to attitude and can even be mounted upside down. Solidly supported on all four corners by nylaguide bearings, it is not subject to deflections caused by cantilever stresses. Radial bearings are sealed, and linear bearings are self - cleaning and self - lubrication. Standard adapter bases consists of a stationary floor mounted frame or plate, a four unit, standard nylaguide bearing and support system, and a moving frame of plate. A heavy duty servo cylinder is nested between the frames and the nylaguide bearings. The servo cylinder moves the upper adapter base plate back and forth in response to hydraulic signals from the power unit. The SRA is designed so that is swings in an arc laterally, pivoting about an imaginary pivot point located exactly in the plane of the entering web path. The servo cylinder swings the other end of the frame, moving the outgoing web laterally back into the desired web path. It can be installed successfully on lines handling fragile materials such as parchment paper, thin metal foil, or saturated paper even.